I don't know why it took me so long to finally watch Dreamgirls. Possibly because I'm not really the biggest fan of musicals. I don't hate them. I wouldn't even say I dislike them, they're just not typically my thing. But what is my thing is girl groups from the 50's and 60's. So I really wanted to see this movie when they first started advertising it, but somewhere along the line when I realized what the plot was, I just got a little disenchanted and set it aside until it made it to the top of my Netflix queue last week. Even then, I let it sit on my desk for a week after it came in. I wanted to hear the music and see the awesome vintage outfits, but I just wasn't sold on the story. Really, that's pretty much the only problem I can find with Dreamgirls, and it's something that you have to really understand the history to get why you can't let that get in your way. If you look to this as only a film, as only a musical, the story is a bit cliche and the characters are well worn stereotypes. The music is amazing, but the arc everyone goes through is predictable. But that's the problem, is that you can't look at this as just a movie. It's practically a historical film, but with songs. The reason we know these characters and this story so well is because we already know it really happened. Maybe not exactly like this, maybe Curtis Taylor Jr. (Jamie Foxx) is a much more sleezy character than Brrry Gordy ever was. But at the end of the day, the interpersonal relationships are ones that you see play out in the music business year after year after year. So how do you settle that as a viewer? The costumes, the acting, the songs, they're all amazing. Granted I wasn't alive during the time period the movie shows, but it seems very accurate and represents the era(s) well. A musical is above all about the music, and not only are the songs themselves top notch but the singing and performances are as well. But there isn't a single new revelation in the movie. It's very, very good but it isn't fresh or new. Plus many people have pointed out that because it's not at all shy about the fact that it's a fictionalization of the history of Motown Records that the film actually could be considered insulting to it's source material. So where do you go with that as a viewer? My opinion, you buy the soundtrack and get a hold of as many of the songs as you can, and then read up on the history of Motown on your own. Unless you really love one of the actors, or musicals in general. In which case, there are much worse ways to spend a couple hours. I pretend that I can say "I don't watch a lot of reality tv" but the truth is I do. It's just mostly I watch the shows where it's talent or art based, where there's an elimination after a challenge each week. Project Runway, Top Chef, that kind of thing. 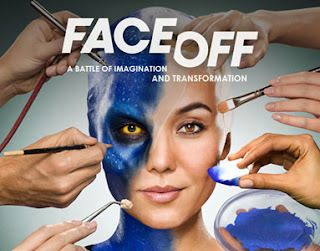 Since I'm a filmmaker, and a sci-fi fan, the show Face Off seems tailor made for me. Because this format of reality show has been around so long, there are a lot of them that are getting to a point where they're just silly and almost nonsense. Mostly that's because of the contestants and the challenges. The contestants aren't artisans, they're reality wannabes, and the challenges aren't artistic they're just crazy. Look to the quickfire challenges on Top Chef. Last week they made everybody make a dish with a product placement item AND they all had to share one knife AND the dish had to be something that related to their heritage. Television Without Pity rightfully called that out as a bit overwrought. Face Off doesn't really replicate exactly the experience of a professional makeup artist. There's not really a way to do that in a competition, that would be more of a documentary. But they do manage to come close, and while I don't really understand the judge's tastes half the time the show does show actual talented artists being talented. Special effects makeup is no joke, and it's much harder than most people think it is. Last month I had to make a short film in a limited amount of time, and the story required the lead to have her knees skinned and bleeding. I had to do the effect myself and I'd say I probably spent more time on that than I did writing the script. The show also doesn't spend a lot of time focusing on silly drama and setting up stupid moments for people to get angry at each other. Sometimes these moments happen, but if you've ever had a job you know working together is tough. The challenges themselves are usually pretty good, though there were a few this season that didn't really let the makeup artists shine, like the Dr. Seuss challenge. While it might seem like the dancing challenges, or the underwater stuff is a stretch the fact is the makeups that these people will be doing will have to go through a really difficult process to actually get on film. The only thing I would change, if I was in charge, would be to actually have a few challenges where the makeups have to be actually shot in film lighting. Frequently something looks too cheesy to really work. Obviously the judges are experienced enough to understand the way something would look under proper film lighting. But the audience doesn't have that skill, and I think it would really help to see the difference. Also, because I love anything that helps a regular audience understand more about the skills it takes to make a good film. It's hard for people to really get lighting and gaffing but this would be cool. In this last season, there was a bit of a controversy where they eliminated a contestant and then had a small competition to bring someone back. When that contestant started doing well, sometimes staying instead of beloved fan favorites, a lot of people started saying she was out and it was unfair for her to come back. I think that's pretty ridiculous, since bringing back an eliminated contestant is an old trope in the reality tv world. Almost every show I watch has done it, and Top Chef has made an entire extra show about it called Last Chance Kitchen. This season, the winner of that will actually be put back in the competition during the finals. So at the end of the day, when that contestant was brought back, she earned her spot and she earned her wins after that as well. But I guess nothing makes people complain more when their favorites get eliminated, I know I still haven't forgiven Project Runway for a few things. Long story short - this is a great show and even if you're only tangentially interested in how movies are made, make-up, or sci-fi you should absolutely be watching when it comes back in January. Random side note, writing a review like this without giving away spoilers is way too hard. I'm not entirely sure where to start on a review of Looper. As somebody who is a big fan of Doctor Who, you would think that I really enjoy time travel stories but they actually make me cranky. I tend to avoid them, it's only because Doctor Who is that good that I even bother. Otherwise I spend too much time trying to make them work and let's be honest, they rarely do. My time travel exceptions also include Connie Willis novels, because she's such a good novelist that she actually has sensible rules that make sense to me. But I'm off on a tangent, which is what time travel stories are usually about, tangents. Which is the problem. Which is why I actually really liked Looper, because it decided to just drop all the pretenses and just be a STORY. I can't tell you how happy I am with that. Too often, time travel stories are just a bunch of people standing around talking about things they all are perfectly aware of, usually the rules of time travel in this particular universe. It always takes the form of the "Well, as you know" lecture and it's not just boring, it's tired, and it opens up all the plot holes and problems for display. Listen, Looper has it's share of plot holes that you end up thinking of in the car on the way home, trust me. But they don't spend so much time trying to make the rules work in the movie that you're thinking about it while you're watching. Heck, at one point when somebody tries to ask a question they dismiss it by saying that it's all too confusing anyway. Because it is. Listen, in every aspect of filmmaking right now you can see a battle for artists to retain the art of storytelling and other people trying to shunt the story to the side for whatever else they think will make things more successful. The answer to what makes a good movie is easy, it always has been, it's storytelling. It's not setting, it's not name actors, it's not special effects. All of those need to serve good storytelling and without it, then it might be an enjoyable movie but it will never be a GOOD one. Looper cares about story and storytelling, and that made me enjoy it. It's about relationships, not fight scenes. The setting, the time travel, it's all secondary to the way these characters are interacting and how their interactions steer their choices and their futures. That's what makes it work, and why it doesn't matter that nowhere in the actual film do they state outright that the time travel only works one specific way. It can only go exactly 30 years into the past, that's it, no finite control. That's never stated in the film, it's just something the writers and director knew as they made the movie and that the director has said in multiple interviews that you can easily find if it matters to you when you're driving home. But that information is known to all the characters, they don't need to talk about it and they don't need to question it except to make people in the back of the theater shut up. I realize I've said almost nothing about the actual plot of Looper, but you get everything you could need to know from the trailer, and then it actually goes to some unexpected places and I enjoyed it more because I didn't know too much about it going in, so I thought I'd let other people be similarly unenlightened. What you really need to know is that Bruce Willis is amazing as always, and the acting is good all around. The visuals are thought out and serve the story and in general everything that the filmmakers did just served to make the story better, which is as it should be. But a quick tip - don't go to the IMDB message boards after you watch it. The people there were not at all paying attention during the actual film and make a lot of very stupid assumptions. If you're going to see Looper, and you should, pay attention. It's a movie that deserves for you to actually pay attention for once. Is the internet exhausting anybody else? I've just spent a half hour writing up two different rants, only to delete them both. The first one, because I knew it would be too difficult for me to really get across what I was trying to say, and I saw how it could be interpreted the wrong way and could be considered hurtful. Which not only would hurt people, which I don't want to do, but also could possibly bring down a bunch of angry people that I don't feel like dealing with. I'm too tired. The second rant was about how tiring it was to deal with angry people, and some ideas about how I try to do things in order to not be an angry internet person. But then I realized that once again, it would take too many words for me to be completely clear about what I wanted to say, and I came across sounding a lot more responsible and clear headed than I think I really am. I'm also too tired to be that responsible. Needing a subject for this blog post, I think clicked over to Facebook to see what people were saying, if anything sparked my creativity. -One friend frequently posts things related to animal activism. Which I fully support, and I thought about writing about adopting shelter pets and supporting no-kill shelters, etc. But then I remembered an argument I saw in the comments of a mostly unrelated post on another blog today where it devolved into a pro-shelter person and a pro-breeder person insulting each other and I yawned because the argument is so old and nobody is budging. -Another friend posted a link about how Facebook seems to be making people "like" companies and pages even when they don't want to. Facebook insists it's all the people accidentally liking things or maybe the company tricking them into liking things. Other people are showing evidence that people who have died are still clicking "like" and that's probably a red flag. I ended up spending a half hour going through my likes to make sure there wasn't anything weird (there wasn't) and that was tiring too. -Everybody everywhere is posting about Christmas. Which has two effects: 1-Christmas is exhausting and 2-Facebook is grouping posts again and I hate that and wish it would stop, but the only thing I seem to be able to tell it is that it's an "inappropriate grouping" but it isn't, so what then? There's got to be a setting somewhere but I'm tired of trying to find a setting somewhere. -I went over to tumblr, where I saw a ton of posts that could inspire me to write, but there were also tons and tons of posts all at once from a few people. I still don't understand how people can find the time to post that much, reblog that much, and generally create that much content. Plus, I don't understand why they don't use the queue feature to spread things out a little more evenly. Now I'm once again trying to figure out how much seeing a person post is worth it when 90% of what they post is of no interest to me, but 10% is cool. If it was spread out, I wouldn't care, but scrolling through three pages of boring is...boring. -I went over to a favorite blog and I keep making the mistake of reading the comments. I like the idea of comments, I frequently want to know what other people think about things. But everybody seems to be jumping to extremes these days, with no room for in between or even discussion about topics. Especially if it involves parenting. And blogs seem to be eager to publish things that get them more angry comments and fights because that actually gets them more pageviews, which means more money. I don't fault them for that, I just wish we had a system that rewarded people for posting good things or something. -And in the world of "first world problems" there's too much good stuff out there too. I read a couple dozen different webcomics, and that's after I've cut down and several of my favorites ended. Blogs, review sites, financial tips, consumer awareness, there's so much good information out there and I want to know as much as I can. But there's just SO MUCH and while they all often will just repeat each other, you never know which awesome blog will originate the good story next. How does anybody keep up, or do they just give up? So yeah, the internet is making me tired today. Which is why I just wrote a thousand words about it...because that's what the internet is for, right? Murderball is an older documentary, I almost labeled this with "classics" but then decided it wasn't quite that old. It came out in 2005, and I have been meaning to watch it every since it was nominated for Best Documentary Feature at the Academy Awards. One thing about watching older documentaries is that there is no better way to really understand how far and how fast the technology has changed. Murderball is only seven years old, but it has that very distinctive video feel of the time. Since I've been making a documentary, I know what micro-budget docs are filming with these days and how they look, and we've definitely moved on to a slicker look. But at the end of the day, that grainy look is part of what helps Murderball work. It's definitely a film that holds up years later because the topic is more or less timeless. It's an easy film to sum up: it's a film about the stars of wheelchair rugby and the rivalry between the US and Canadian teams. It has all the hallmarks of a good sports film, fiction or non. The rivalry has a long history, there's a coach with a history of playing on the U.S. team who left to coach Canada after he didn't make it on the team one year. You've got the expected personalities, and even a "new kid" who is interested in the sport and wants to play. There are even groupies. From the look of things, the filmmakers were probably filming for a little over a year on the project. So many things happen over that span, and that helps it to follow more narrative ideas as the "characters" grow and change. They reconcile with people from their past, one faces a health crisis, another deals with recovering from the accident that paralyzed him and learns about the sport for the first time. The trick that makes this all work is that they must have had an amazing editor. The film could have been very scattered, or even very boring. But they don't spend a lot of time on the things that bog down a typical sports documentary and instead focus on the actual people, which is the part everybody cares about anyway. You get the gist of the rules, you learn a bit about the chairs themselves. But anything that you could easily learn with an internet search is left to the wayside unless it's needed to understand the people. Overall, it was an excellent film and I think any sports fans would enjoy it. Those who like documentary will like it as well, and I think the pace and storytelling skills are good enough that even those who don't like documentaries as much should give it a try. Just sleep more, it's easy! So, for the last three or four days, I've had this really annoying twitch in my right eye. It comes and goes, nothing too bad, just annoying. I was trying to figure out if there was something I could do about it. Can a warm or cold compress help, would any kind of OTC medication do any good, that kind of thing. Because I can tell it isn't anything problematic, and I'm almost certain it's just from looking at the computer too much because I've been working a lot. I know that looking up medical advice online is a dangerous thing anyway. But you can usually separate a lot of the junk from the real knowledge relatively easily. In this case, there were basically only two pieces of advice on every single site I checked: reduce stress and sleep more. I had another medical issue earlier in the month, and the three different doctors during the course of the day told me I should try to reduce my stress (they didn't mention sleep, I don't think they heard me when I said I'd only slept a couple hours, there were other things on their minds). It's made me start thinking about it, and how often in my life I've had doctors just tell me to be less stressed out and to sleep more. How often we're told that, repeatedly. Sure, it's sound advice. We probably all need less stress and more sleep. But it's nonsensical in a lot of ways, because at the end of the day stress and sleep schedules are widely outside of our control. There are some things we can do, but it only is so much. Stress often comes from jobs or money, things that we can't just cut out or change or fix easily. At the moment a lot of mine comes from health care and health insurance. But all of the issues with that are pretty much out of my control. Literally an Act of Congress can't manage to take care of most of it. In the past few months, a significant number of my friends have had problems with their living situations and had to move on short notice. Who knows how many people are currently fighting to deal with their underwater mortgages and foreclosures. All of this unavoidable stress that so many people are under is of course causing them to have insomnia. Or they're working long hours at multiple jobs so that they can pay for things and don't have time to sleep. Not to mention that Americans all have this cult of exhaustion going on. Have you ever heard two people at a job trying to one up each other with how little sleep they've gotten or how many coffees they've had to drink to be awake. Heck, even the show I'm watching just had a joke about how "we can sleep when we're dead." Not to mention, how many of us have had bosses that expect long hours and even extra work once you come home? We live in a society that wants us to sacrifice everything, including sleep, to get ahead. And if you don't want to make that sacrifice then you're not just punished, you're shamed and insulted. I once had a job where I had to argue with them repeatedly that it didn't matter if they offered me extra hours or overtime pay, I had other things I was doing (I was a grad student at the time, and I'm married) and that no amount of money was worth my little spare time. If we're supposed to reduce our stress and sleep better to help our health, then maybe we need to start looking at larger problems in our society and how they're affecting us in both large and small ways. I had put off watching Castle for a long time, for a lot of reasons. I worried that it was only popular because of Nathan Fillion, because sometimes super fans don't always have the best record and are very forgiving of things if their favorite actor is involved (I'm guilty of this too). Also, because I watch way too many murder mysteries. It's one of my favorite genres, but I've felt a little burnt out on them. I started watching a different police procedural type show recently, and I only got a few episodes in before I just gave up because it felt like more of the same. There was nothing to draw me in, I was just bored with how predictable they've all gotten. And none of the characters really interested me either. I was really afraid that was going to happen with Castle too. It only took ten minutes of the first episode to change my mind. All I needed was to meet the main characters and I was sold and ready to give this more time. The thing about mysteries, both novels and shows, is that they are a well worn genre. There are certain character archetypes, relationships, red herrings. The problem is, that for mystery fans, you can't leave these things out. It's a danger with any kind of genre work, you have to be part of the genre but you don't want to be the exact same as everything that came before. The problem is, that a lot of shows try to circumvent this by doing the whole "but that's in books/on tv/in movies, this is real life!" argument. Don't get me wrong, Castle goes into this too, but they do it in a way that I love. Instead of the skeptical character going "this is real life!" you have Castle spinning his crazy stories and Beckett saying that this is police work, not a novel, and they need evidence. And on top of that: Castle's theories are usually wrong. The show is just so creative. They're able to give the characters so much backstory, without it feeling forced or inconsistent. Even if the writers don't have the entire long story mapped out, they're very good at staying on track with their characters. Normally the first season of a show is where the characters are figuring out who they are, and the actors are trying to find themselves in the role. But Castle didn't feel that way. Every single actor on the show is pulling their weight, and they're all amazing. Every character that could be a cardboard stereotype, especially Castle's family, isn't. There isn't a single recurring character that isn't layered, interesting, and awesome in some way. Even the "Moonlighting" style relationship between Castle and Beckett doesn't feel tiresome and played out, but like two people genuinely getting to know each other and having a relationship build from begrudging co-workers to friends to possibly more. I haven't really gotten into the specifics of season one, I know. But that's because the specific episodes almost aren't even the point of the show. Yes, the murders are all a little weird but the resolution of them is actually my kind of mystery. They keep me guessing, and with one notable exception, I almost always am following the same dead end trail as the detectives until they prove it wrong. It's the first time in a very long time that I've been excited to not know what's happening, and to have no desire to look up spoilers and know things ahead of time. Also, unlike some shows on television (some of which Castle calls out without naming and those jokes are hilarious) they actually follow police procedure that seems realistic. Plus, so far I haven't seen them break any laws or violate anybody's civil rights to get the bad guy like some other shows I could name. Beckett actually delegates responsibilities to other departments and members of her team in a realistic way, rather than having some lab tech question suspects or a showing a beat cop running forensic tests or something. The first season of Castle is only ten episodes, and I can see how it might have been a hard sell to the network in the first place so they only ordered a short season. But it finds it's groove so quickly that I'm still terrified it can't stay this good for that long. But then the season finale ends not on a physical cliffhanger (somebody held at gunpoint, somebody kidnapped, whatever) but on a very strong emotional one. You have to watch the next episode, not to find out what happens (though that's part of it) but to find out how they FEEL about what happened. And that, my friends, is the mark of good television. I reviewed the film Battle Royale a while back, and after I watched it I really wanted to read the original novel. I had an eBook version, so a lot of my criticisms I had to pull back because I don't know if the formatting was messed up. I don't know what it is about eBooks but even ones I've bought recently have had some really screwed up formatting going on. There's also a challenge in reading a book that was originally written in another language. You can never tell if the problem you have is actually in the text or in the translation. Now, this is far from the first time I've read a translated book. The Ring cycle by Koji Suzuki are some of my favorite books. But it doesn't seem like Viz really spent a lot of time on the translation of Battle Royale. There are plenty of pros to the book version over the manga or the film. There's a lot more story so that it's easier to actually believe the character development and the time frame for everything. Some of the characters are better established and more interesting. Especially when it comes to the main three characters. The problem is that the characterizations of the villains and their motivations are very, very weak. Both of those villains were better fleshed out or treated in more interesting ways through other iterations of the story. But the problem was that the writing style was very pulp, which is what lead me to wonder about the translation. It just felt unrefined and a little weak. I know that the original novel wasn't really fancy literature, but this felt even a little more unrefined than I expected. The reading level was just a little low, and that made it less fun to read. Not that it's a particularly fun to read a story about the brutal murder of teenagers by their classmates, but you get my point. The other problem was that the story was very basic when it came to talking about the characters, or their motivations, or even feelings. But whenever there was a gun involved, it suddenly got very detailed and started sounding like a manual. It's one thing to be concerned about getting the details right but this is over the top. Overall, I've already talked about the story itself and what I think of it, and it still holds up in the novel. But of the three versions of the story, I'm not sure it's the strongest. Despite the excessive gore and disturbing nature of it, I'd say the manga is probably the strongest version, but the movie and book would be up to personal opinion.